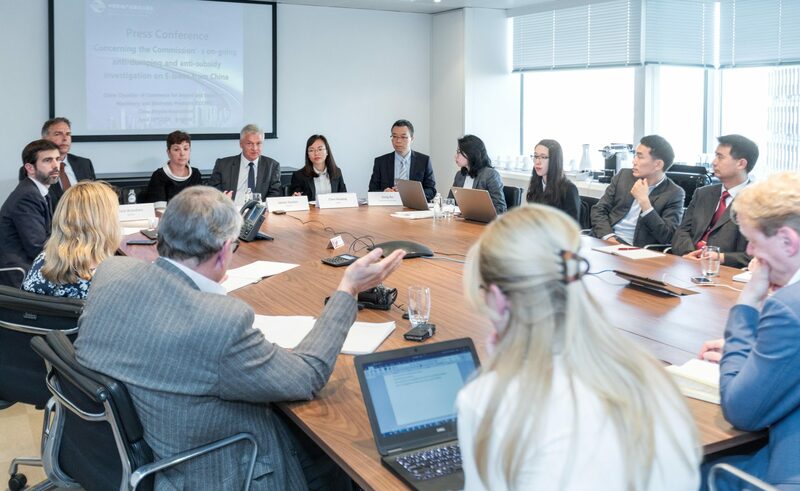 On 18 April, the Chinese Chamber of Commerce for Imports and Exports of Machinery and Electronic Products (CCCME) organized a press briefing in Brussels. CCCME reported on the meeting with the European Commission that took place earlier that day and explained the position of the Chinese E-bike industry in the dumping case. LEVA-EU attended the press briefing on behalf of the Collective of European Importers of Electric Bicycles. A select group of high-level journalist, mainly representing general press such as Politico, M-Lex, the Financial Times, de Telegraaf, …, asked a lot of questions. On behalf of the trade press, Bike Europe’s Deputy Editor in Chief, Jack Oortwijn, was atteding too. In the meantime, he has published an illuminating article on the Bike Europe website, see: http://www.bike-eu.com/laws-regulations/nieuws/2018/4/striking-issues-surface-in-china-e-bike-dumping-case-10133622 In this article, he quite correctly concludes that the issue of the Chinese statistics is the key issue in this case. EBMA is building its complaint on Chinese statistics, which they keep confidential because they obtained them by paying a fee. “LEVA-EU was at the CCCME press briefing yesterday on behalf of the Collecitive of European Importers of Electric Bicycles. As a result, we would like to further clarify what was precisely said about Chinese export data. It is not quite correct that, as stated in the article, Chinese government regards the data as confidential. Under the Chinese 8 digit export code HS 87119010 (????? – diandongzixingche), there are general export statistics ????? – diandongzixingche, which means electric self-propelling vehicles. These statistics are not accurate to determine the export of electric bicycles, because they also include other electric self-propelling vehicles such as for instance monowheels, electric scooters, hoverboards, etc. Under the Chinese 10 digit export code HS 87119010, all details about the individual export transactions are available, such as name of exporter, type of product, export value, etc. It is this information under this 10 digit export code, which the Chinese government regards as confidential. There is nothing exceptional about this, Eurostat does not provide any commercial details on the general import statistics either. The problem that the Collective is confronted with is that EBMA is building the whole case on statistics under this 10 digit export code. EBMA claims that they have been able to obtain these statistics against a fee. This allegedly has allowed them to sift the statistics and present Chinese exports of electric bicycles only. However, EBMA claim that they cannot disclose the identity of the information provider because “it would be of significant disadvantage to the party providing the data“. EBMA further states: “Disclosure of the source would manifestly and irresponsibly expose an unrelated third party service provider to potential economic retaliation because it has provided data to EU complainants in this significant anti-dumping investigation.” The Collective has on several occasions requested the Commission to disclose the identity of the provider because that it is the only way to allow the Collective to check the statistics on which the EBMA is basing the whole case. All this raises the question as to how this “unrelated third party service provider” was able to obtain and sell information, which is classified in China. And another key question is: why not just using Eurostat-statistics, since Eurostat is the official data supplier of the European Union.